CYPETHERM ASHRAE LOADS is an application conceived to calculate the thermal loads in buildings and uses the Radiant Time Series Method (RTSM) proposed and recommended by the “American Society of Heating, Refrigerating and Air-conditioning Engineers” (ASHRAE) to calculate the cooling loads and the procedure to calculate the heating loads; both described in the “2010 Load Calculation Applications Manual” (Jeffrey D. Spitler. Load Calculation Applications Manual. ASHRAE. ISBN 978-1-933742-72-4, 2010). 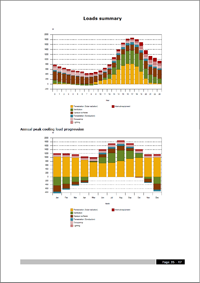 The analysis is carried out in accordance with ANSI/ASHRAE/ACCA Standard 183-2007 (RA 2011), Peak Cooling and Heating Load Calculations in Buildings Except Low-Rise Residential Buildings”, which establishes the minimum requirements to be met by any method or procedure used to calculate the peak cooling or heating loads. 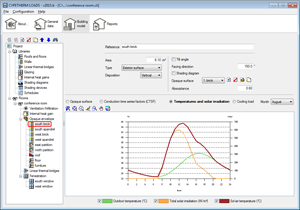 CYPETHERM ASHRAE LOADS incorporates ASHRAE’s Weather Data Viewer 4.0 (used with permission), where users can choose amongst 5,564 stations around the world to import the weather data required to calculate the thermal loads. The program obtains the solar radiation data by applying ASHRAE’s “Clear-sky Solar Radiation” model based on the data contained in the “Weather Data Viewer 4.0” database. The program allows users to define use profiles for the different heat gains, as well as use shade patterns on external surfaces. Shading elements such as overhangs or eaves can be introduced in openings as well as internal protection to reduce radiation. The cooling thermal load calculation results are provided for the 24 hours of the design day of each month (day 21), as well as the results for the heating loads for each precinct and zone. CYPETHERM ASHRAE LOADS offers real-time graphs and diagrams of the results, so that any repercussions on the results due to any changes can be seen quickly and clearly. 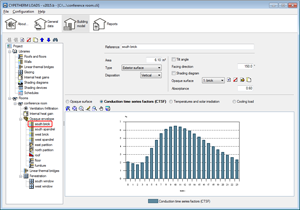 Amongst the methods which precisely estimate the thermal interchange of a building, the most complete method is the Heat Balance Method, although the most widely used method to estimate the thermal loads due to its speed and robustness (recommended by ASHRAE) is the Radiant Time Series Method (RTSM). As well as these virtues, the main value of this method is its clarity (and not simplicity), as the Conduction Time Series Factors (CTSFs) and Radiant Time Factors (RTFs) provide users with a very clear vision of the damping effects, the delay in time of the heat gain due to conduction and the reaction of the precinct to the heat gain by radiation. The RTSM considers each energy contribution independently to finally estimate the amount of energy passed on to the air of the precinct as the sum of all the contributions. These contributions or heat gains are divided into their convective and radiant parts. The energy of the convective part of the heat gains is transmitted directly to the air of the precinct, and so is considered directly as a thermal load. This does not occur with the radiant part, as it is not transmitted directly to the air; it undergoes a transformation and incurs a delay related with the interaction of the radiation with the surfaces of the precinct. All these concepts appear described and accompanied by graphs and diagrams in the real-time application, so that any repercussions on the results due to any changes in the properties of any of the elements participating in the thermal cooling load calculation (weather conditions, properties of the opaque and/or translucent construction elements, internal gains, ventilation, etc.) can be seen quickly and clearly. 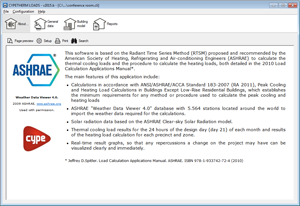 The main screen of “CYPETHERM ASHRAE LOADS” is similar to “CYPETHERM ISO 10211”. 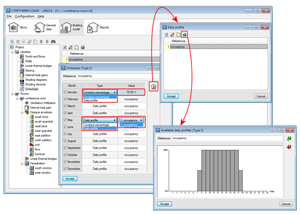 “CYPETHERM ASHRAE LOADS” contains four sections that can be identified using the icons situated along the top: About…, General data, Building model and Reports. 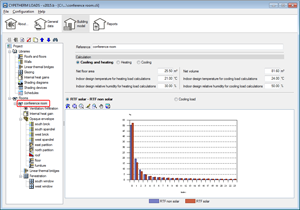 Offers information on the program properties and the procedures used to calculate thermal loads. The locations of the building and weather data are introduced here. 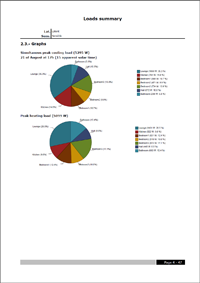 This data can be imported from ASHRAE’s “Weather Data Viewer 4.0” database. The properties of the construction elements (floors, ceilings, walls, thermal bridges, glazing, shading devices), internal gains, shading diagrams and use profiles to be used in the building are defined here. All the precincts of the building are created, with the following data: the ventilation/infiltration, internal heat gain, opaque envelope (by selecting the elements it is made up of from those defined in the Library), the linear thermal bridges and openings. 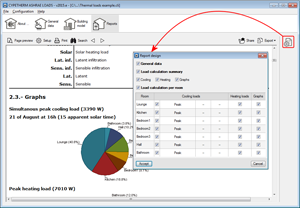 The program includes a handy tool to configure the results report which allows, amongst other things, to include available sections as well as select the type of load to be listed from each precinct, even the specific moment for the thermal cooling loads. 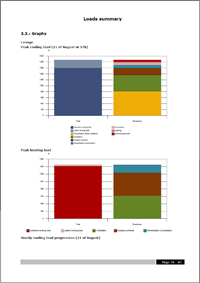 Click on one of the images below to view and download an example of the thermal loads report generated by the program. 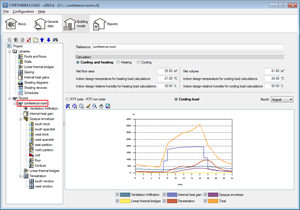 As of the 2015.f version, CYPECAD MEP allows users to export jobs to CYPETHERM ASHRAE LOADS from the “Air conditioning” tab. 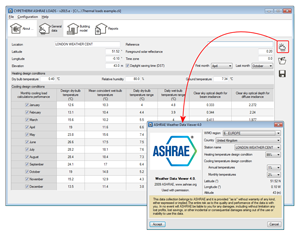 If more than one precinct group has been defined, users have to select the group to be exported to CYPETHERM ASHRAE LOADS. In upcoming program versions, users will be able to export the complete job regardless of the number of precinct groups it contains. 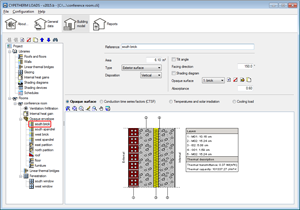 To be able to use CYPETHERM ASHRAE LOADS, the user license must contain “Calculation of cooling thermal loads”.